Dengue fever is a mosquito-borne disease that is found throughout the tropics and sub-tropics. It is a viral infection carried by day biting mosquitoes. The symptoms are excruciating pain in the bones, fever, muscle aches, and rash. Most cases are not serious, and only last a few weeks. A more severe form known as severe dengue (dengue hemorrhagic fever) has similar symptoms but also causes internal bleeding and bleeding through the nose and gums. This form of the disease can lead to shock and death. The world health organization reported that this fever is now the fastest spreading vector-borne virus on Earth. There have been 50 to 100 million new cases reported each year in the last decade. The range in which it occurs is expanding horizontally and is increasing its range upward in mountain areas as warm temperatures move to higher altitudes. Most cases are found in urban areas. Mosquitoes that carry the fever are increasing in numbers in urban areas where stagnant pools of water form in unused containers and puddles. There currently exist no vaccines or medications specifically for the disease. There is currently a worldwide pandemic and it is most common in India, Viet Nam and the Caribbean. It appeared in South America in the last decade of the 20th century and it existed on the Pacific side of Costa Rica for some time. There were epidemics there in 1993 and 1994. In 1995 unusually warm weather allowed the mosquitoes to cross the mountains into the rest of the country. 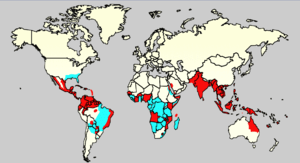 Outbreaks of the disease occurred in other areas of South America also. Thousands died of the epidemic and nearly 150,000 were infected. In the fall of 2007, dengue fever spread across the Caribbean in one of the worst outbreaks in decades. Health agencies declared the disease was at near record levels in 2007. It affected hundreds of thousands of individuals and killed more than 200. Puerto Rico reported some 5000 cases in 2012. An epidemic of the fever ravaged Charleston, S.C as early as 1828. The fever was endemic in the south of the United States prior to World War II. Following the war a nationwide program to eliminate flies and mosquitoes was begun. This attempt included ridding the country of malaria. The program largely eliminated dengue fever in this country. However, cases are now diagnosed in the United States nearly every year in persons that have traveled to regions where the disease is endemic. The Center for Disease Control reported that 1167 of these cases were reported between 1996 and 2005. There were 25 cases reported in Brownsville, Texas in 2005. Blood tests were conducted by the CDC on residents of Brownsville. Thirty-eight percent showed signs of past dengue infection. Eleven percent of these had not been outside the country and so had to be infected in the local area. Two and one-half percent of those tested showed signs of recent infection. Chikungunya (Chicken Guinea) is a disease similar in symptoms to dengue fever. The disease is a relatively new mosquito borne viral fever. The symptoms are sudden high fever reaching 39ºC (102ºF), a variety of skin rashes and other skin irregularities, arthritis of the joints, and headache. Severe joint pain may last for weeks or months. In the recent epidemic in India, high fever and joint pain were the most common symptoms. Fever normally lasts about 48 hours before breaking. The mosquitoes carrying the virus are found in the United States, especially in the South. The Center for Disease Control reported that cases have developed in the United States in persons who have traveled to the areas where outbreaks were occurring. An unknown number of Canadian and Europeans have also contracted the disease. None are known to have developed in individuals that have not traveled to regions where the disease is endemic. Several factors have led to the increased numbers of persons contracting these diseases. The higher temperatures associated with global warming increases mosquito activity, the human population is increasing in the areas where the mosquitoes are found, and more people traveling into and out of the affected areas. Categories: Climate Change and Diseases | Permalink.